The Tribal/State Programs is a unit of the Center for Families, Children & the Courts. With federal and state funding, the Tribal-State Programs provide legal services and technical assistance to local courts on inter-jurisdictional issues across all case types and assists with the development of policies, positions, and programs to ensure the highest quality of justice and service for California’s Native American communities. View the new list of agent’s for service of ICWA Notice, published in the Federal Register on June 4, 2018. Learn about the new federal regulations governing ICWA. According to most recent census data, California is home to more people of Native American/Alaska Native heritage in urban and rural areas than any other state in the country. There are approximately 110 federally recognized tribes in California and 78 entities petitioning for recognition. Federally recognized tribes have a unique government to government relationship with local, state and federal entities, and are recognized as sovereign nations. Tribes can create their own laws, governmental structure and enrollment or membership rules for the land and citizens of their nation. More. The Indian Child Welfare Act (ICWA) (25 U.S.C. §§ 1901 et seq.) is federal legislation, which establishes minimum federal standards for state court child welfare proceedings and many other “child custody” proceedings involving Indian children. In 2006, with the passage of California Senate Bill 678, effective January 1, 2007, codified many of these requirements into the Welfare & Institutions Code, Family Code, and Probate Code that govern Indian child custody proceedings. This legislation affects California dependency, delinquency, guardianship and some family proceedings involving Indian children. Family violence occurs throughout every community, but for tribes there may be crossover and jurisdictional issues that are important to understand when working with Native American communities. Areas of family violence addressed in our unit include: domestic violence, dating violence, sexual assault, trafficking, elder abuse and stalking. More. California’s tribal justice systems may handle an array of different case types, may function similarly to a state court or traditional customs of the tribe and create their own legal codes. 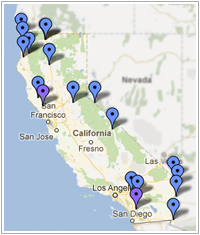 Currently there are 22 tribal courts located in California that serve approximately 40 tribes. More. To learn whether you have a tribal court in your county, please visit the California Tribal Courts Directory and interactive google map.